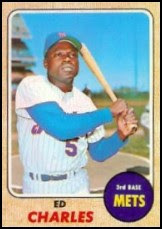 Third base was a revolving door for the Mets for the 1960’s – Ed Charles is tops here, but not by much. Ed Charles was both the jovial elder and poet laureate of the 1969 Mets – but it wasn’t an easy journey to get there. Charles was drafted by the Boston Braves in 1952 as a 19-year-old kid from Florida. He got in just a season-and-a-half in the minor leagues before his career was delayed – he was sent off to fight in Korea, missing half of the 1953 season and all of 1954. A now 22-year-old Charles returned to play for the Corpus Christi Clippers in 1955, the B level affiliate of the Milwaukee Braves, batting .333 in 141 games, which is not too bad for someone who was in Korea the year before. Charles played two years at the single A level before finally making it full time to the AAA level as a 25-year-old. He batted .284 in 1958, .270 the next, struggled to a .252 average in 1960 only to rebound by hitting .305 in 1961 – but of course that’s four full seasons at the AAA level, and he was 28 for the last season. Charles was never going to make it to the Majors with Milwaukee where another Ed, Eddie Mathews, was manning third base, and time was running out. Since being drafted in 1952, Charles had played in 1143 minor league games for teams in Quebec, Texas, Kansas, Kentucky, and Vancouver and spent a year-and-a-half with the armed forces in Korea, but he still wasn’t much closer to reaching the Braves then when he started in 1952. Ed was only finally able break into the majors in 1962 after being traded in the offseason to the Kansas City Athletics. He would turn 29 during his first month in the major leagues, roughly ten years after his professional debut. If you believe in clutch hitters, Wayne Garrett’s got the resume – a 109 tOPS+ in high leverage situations for his career (tOPS+ measures a players performance relative to his career performance, higher than 100 is better than normal performance, lower than 100 is worse). Even more impressive, Garrett has a 130 tOPS+ with 2 outs and runners in scoring position for career. Of his 61 career home runs, 36 were go-ahead or game tying home runs, including 2 walk-offs. For someone with a career .341 slugging percentage, Garrett knew how to pick his spots. Howard Johnson started at least 52 games at each positions in the batting order. Johnson, a switch hitter, had a sizable platoon split – .811 as a lefty hitter and .726 as a righty. Again, switch hitting is useless. 2-3 in the bottom of the inning on three ground balls. For more on Fonzi, take a look at my second base rundown, here. He’s the top second basemen of all time for the Mets, and the third-best third basemen. When you calculate the Mets 2011 payroll, don’t forget that the Mets will start paying Bobby Bonilla $1.2 million dollars that year and every year until 2035, in an agreement arranged in 2000 when the Mets released Bonilla – so Omar Minaya’s replacement will have to deal with that too.